The HD-9AE alignment lift features adjustable multi-position leveling, integrated front radius plates and rear slip plates. This makes it compatible with all leading alignment instrumentation, including 3D and camera wheel alignment systems. Every BendPak alignment lift offers the same quality, warranty and built-in safety features as every other car ​lift we make. Wheel service is where many shops make the big bucks, so we’re conscious of the fact that these lifts need to be dependable and efficient to keep you satisfied. 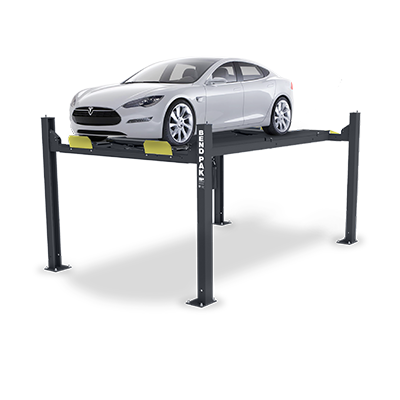 The high capacity on this alignment lift is also great for light-duty trucks and SUVs. Free-floating alignments are made easy-to-handle to help you get to work without delay and generate faster turnaround. Multi-caster slip plates are positioned in the rear, with turn plates established in the front. This allows for the most precise alignments in the business. Corrosion-resistant galvanized turn plates are easily positioned using BendPak’s turn plate pockets. These dual recessed turn plate pockets get your turn plates in the precise spot they need to be to best facilitate vehicle positioning. This provides more clearance for your equipment installations. BendPak alignment lifts have 10.5” diameter cable sheaves within the runway and cross tubes and 2.25” diameter sheave axles. This is essentially the same cable-routing system found on our full-size car lifts, which means our exceptionally over-engineered alignment lifts are prepared to service your shop with hardly any maintenance for years to come. 1/2” diameter 6 x 25 aircraft-quality stainless-steel lifting cables are routed internally through the post structures. Alignment lifts are some of the busiest lifts you have, so we’ve made ours totally resistant to chemicals, weather, oil, etc. We hope you use them all day, every day to increase both your bottom line and your shop’s efficiency. Lift your turn plates above eye level or take them down a few notches to help roll your wheels or set your Ranger 3D alignment pads. Whatever height helps you get the job done, BendPak offers maximum versatility. Not to mention, each height position automatically locks in places and releases with the push of a button. Grease fittings are standard on all BendPak alignment lifts, car lifts and parking lifts. Their job is to keep the cable sheaves greased and the cables running smoothly. There’s little to no maintenance required on these fittings over—what we hope are—many, many years of successful wheel alignment. Hydraulic flow dividers are crucial safety features, and we wouldn’t dream of leaving them off any hydraulic lift we manufacture. The safety assurance they offer is the total confidence that even in a worst-case scenario, your alignment lift is incapable of crashing to the floor. Flow dividers also guarantee level ascents and descents with each use. Durable springs facilitate lock engagement as the lift platform ascends over each ladder position. Even if your garage floor has a slight slope, the spring-loaded locks will accommodate for the tilt and keep your rise even at all times. It’s easy to release your alignment lift locks with the simple push of a button. The pneumatic lock release instantly releases all four locks in a single, simultaneous motion. The aircraft-quality stainless steel and aluminum pneumatic cylinders minimize long-term service and make all maintenance easy to perform. Never worry about cable slack ruining the safety of your alignment lift posts, not to mention your vehicle. A secondary lock system detects cable slack and stops all ​lift functions the second less-than-ideal cable tension is detected. Cables, sheaves and airlines are safely tucked with in the alignment lift structure. This extends their lifespans and maintains a clean look in your shop, especially busy service bays that contain multiple lifts. The electric-hydraulic power system features an easy-to-read, ergonomic display for fast-access at all times. Stop and start buttons, warning indicators and emergency halts are all logically arranged for your convenience. Textured runways prevents skids, even when the surface is wet or splashed with oil. You’ll never worry about heavy vehicles slipping off the ramps or sliding out of place during alignments. We would be doing you a disservice if we didn’t make ramps that accommodate low-clearance vehicles (i.e. race cars, sports cars). Our entry and exit ramps are extended to provide easy access to large and small vehicles alike. A thick, tough, rubber conduit protects all airlines and hydraulic hoses. The conduit is flexible, so your hose positioning is never altered or restricted, and the material is entirely non-conducive and resistant to chemicals and oil. Our alignment lifts are protected from top to bottom, and features like our flexible protective conduit let you feel the difference. If you want save some time and perform wheel and brake service on the same alignment lift you use to align the wheels, there’s no need to switch car ​lifts if you have rolling ​jacking beams on hand. Telescoping arms and frame contact pads reach the vehicle frame’s lifting points by extending over the runways. The runways themselves are fully adjustable for different tread widths and feature three locking positions for your convenience.